Product prices and availability are accurate as of 2019-04-13 18:19:47 EDT and are subject to change. Any price and availability information displayed on http://www.amazon.com/ at the time of purchase will apply to the purchase of this product. 62 days. Pushing its deep orange-red shoulders up to the surface days and even weeks sooner than most others, Scarlet Nantes is an exceptionally sweet variety just made for slicing! The 6- to 7-inch roots are firm, straight, and not tapered, with inconspicuous cores and plenty of tender, crisp, and ultra-sweet flavor in every bite. Higher in vitamins A and B than their store-bought counterparts, home-grown carrots are also rich in calcium and phosphorus -- and they taste delicious! Carrots are a cool-weather crop, best sown direct as soon as the soil is workable in spring, or in late summer for fall harvest. Heavy soils are a problem for root development, so prepare the soil thoroughly before planting or, if you are in a clay soil area, consider growing in raised beds or even containers. 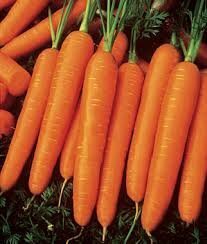 Carrots also need moisture to keep from splitting. With these needs met, they are virtually trouble free! Thin the seedlings to 3 inches apart. Harvest the roots as soon as you want, but certainly when they are less than 2 inches across; the smaller the tastier!